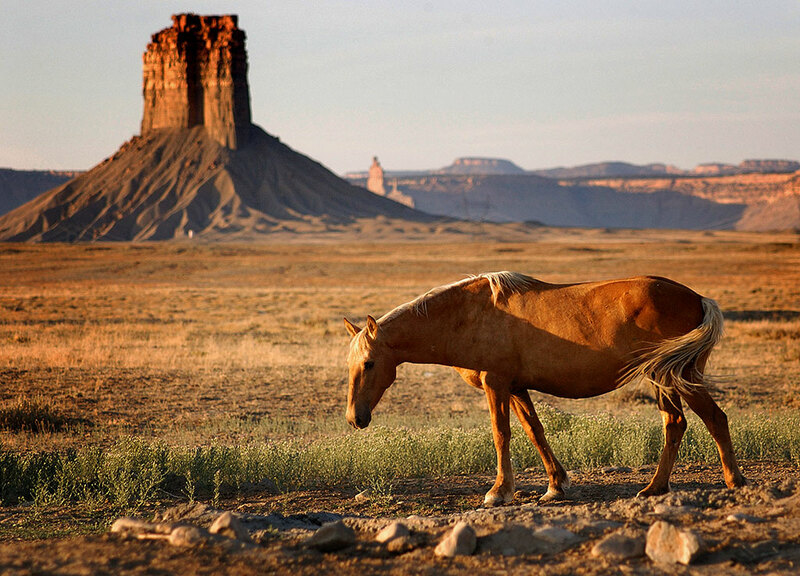 A horse grazes near Chimney Rock in southwestern Colorado at Sunset. 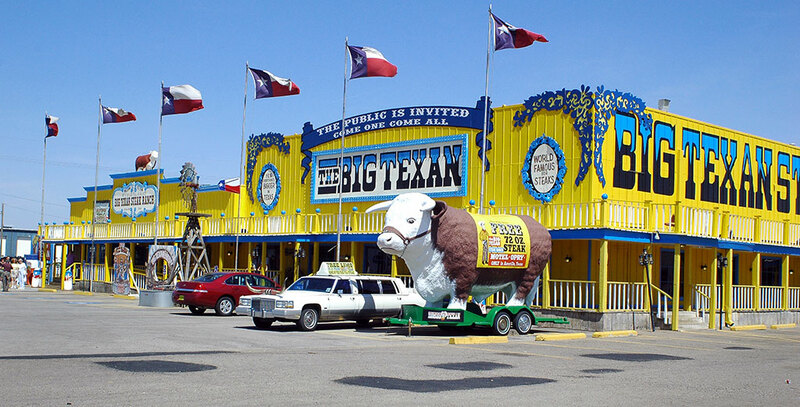 One of the campier sites along the road west is The Big Texan, where you can have a free 72-ounce steak if you can eat it within an hour. I’ve made this drive on a few other occasions, but never in June during maximum daylight. This allowed me to shoot more along my route. 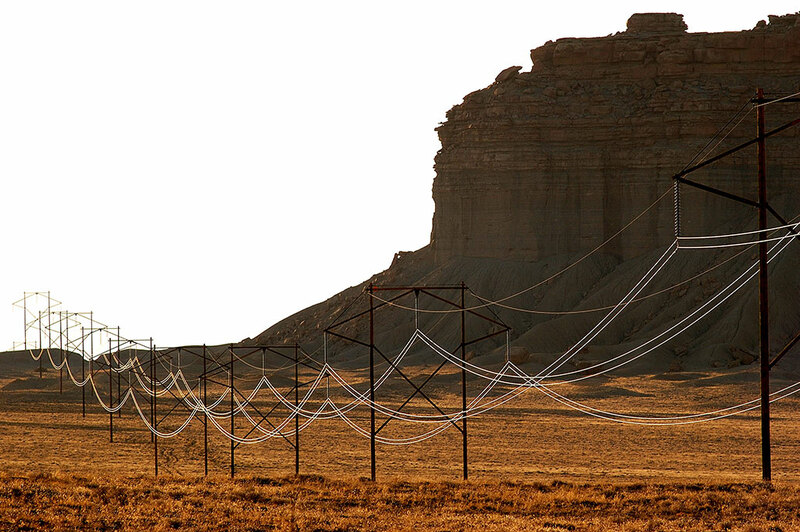 Power lines and a butte catch late light near Cortez, Colorado. 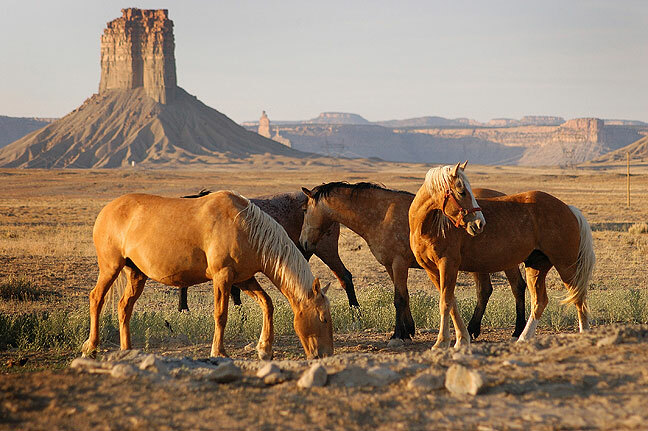 Horses graze in the late afternoon sun with Chimney Rock, Colorado, in the background. 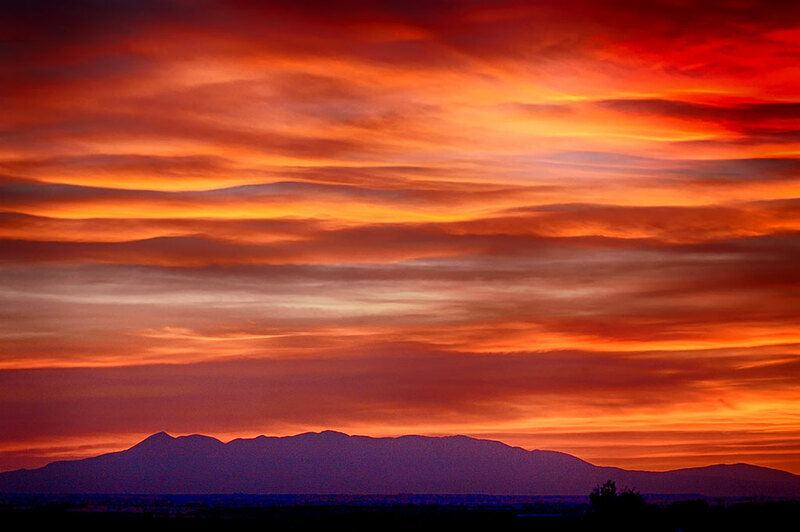 I made this image of the Abajo Mountains after sunset from near the Colorado-Utah border. 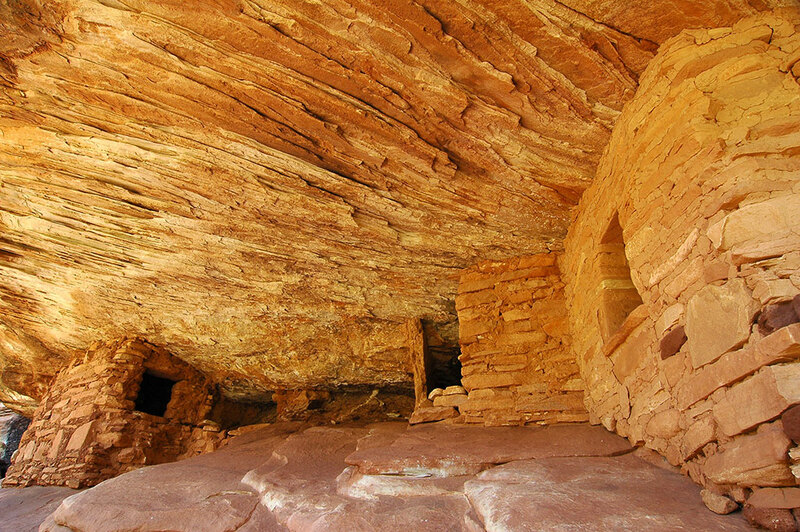 Chester Park at Canyonlands National Park is one of my all-time favorite places. 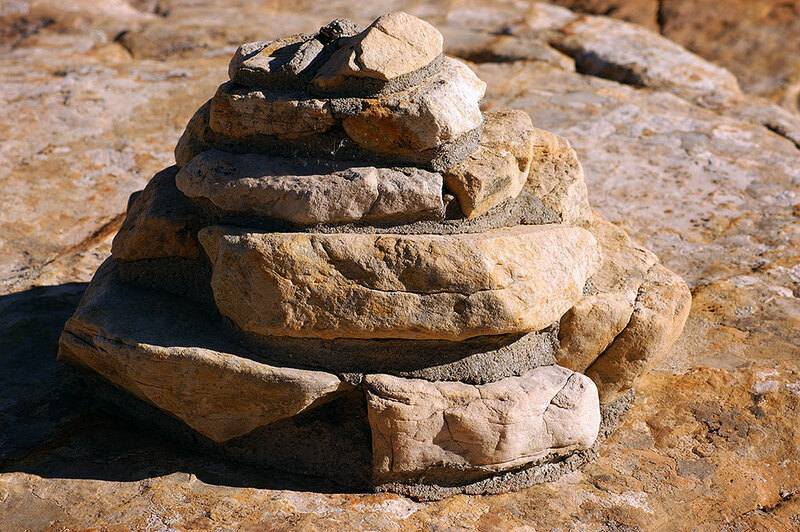 I started at the Elephant Hill trail head in Canyonlands National Park, with the intent of just hiking in a mile or two. By the time I made it to Elephant Canyon, I decided I would go all the way to Chesler Park. During the entire 5.2-mile round trip, I only saw nine other people. 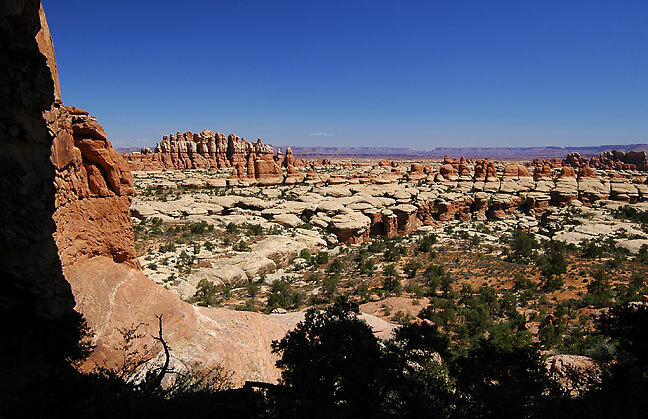 Looking north from Chesler Park, Canyonlands. 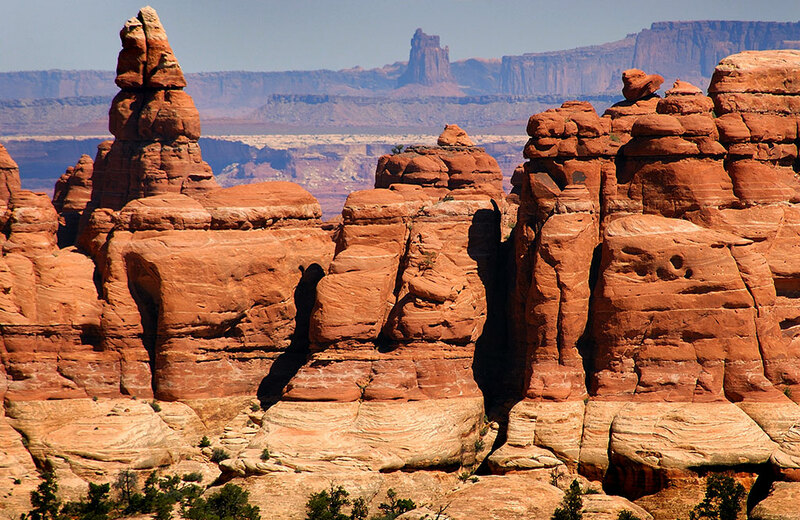 Sandstone stands watch at Canyonlands National Park. This distant view looks north from near Chesler Park at Canyonlands. 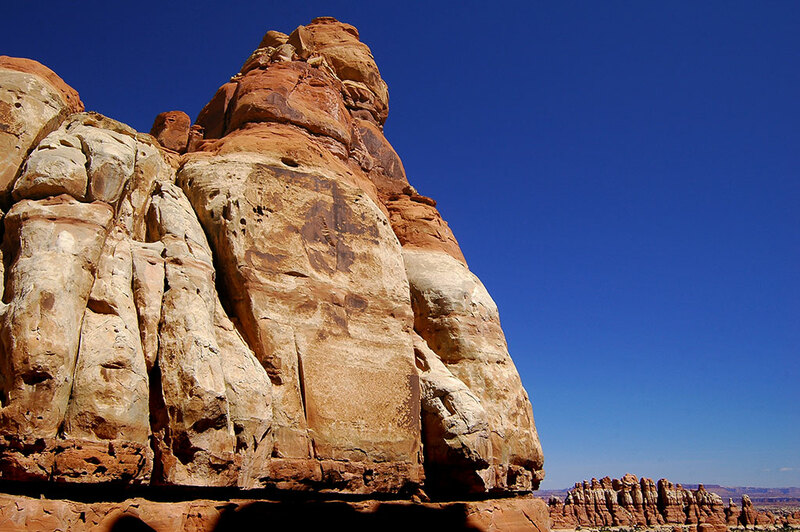 Near the Elephant Hill trail head stands “the wall,” an impressive formation in the heart of Canyonlands. 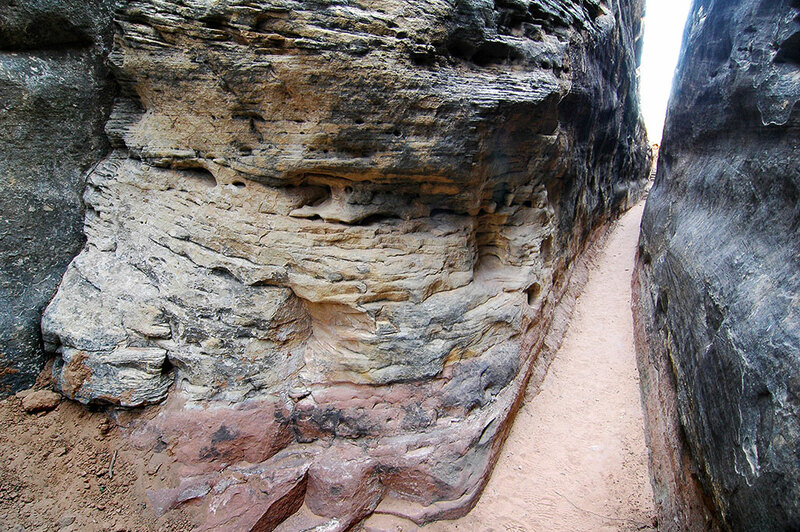 The Chesler Park trail goes through this narrow passage. 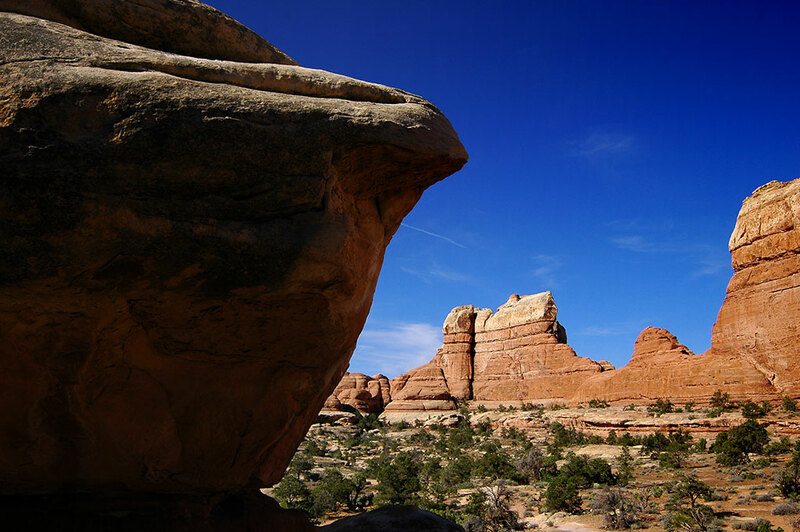 A pure blue sky and record heat accompanied me to Chesler Park. 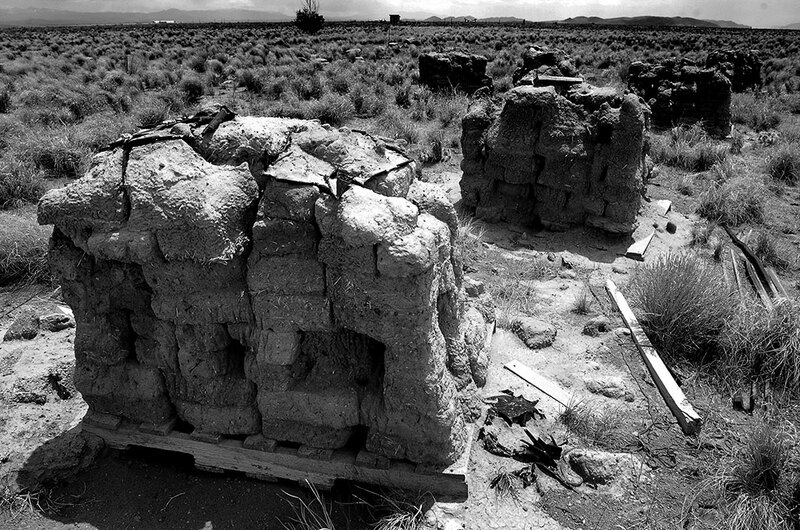 This cairn at Butler Wash is the only cairn I’ve ever seen that was cemented together. 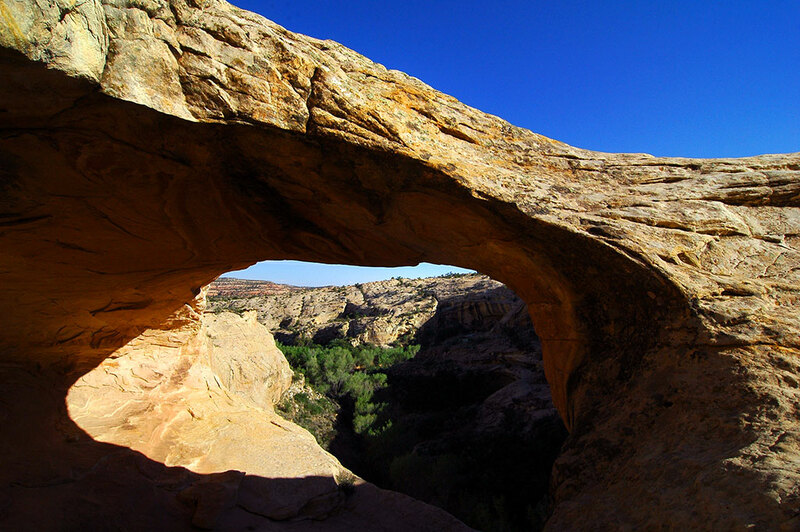 In late afternoon, I hiked the short trail to Butler Wash on Cedar Mesa, to a view of native ruins and a handsome natural bridge. 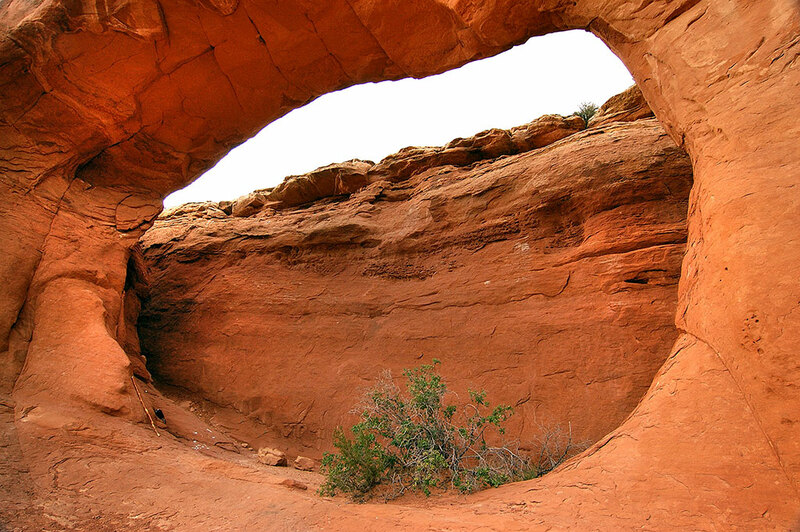 At the end of the Butler Wash Ruins trail is this handsome natural bridge. 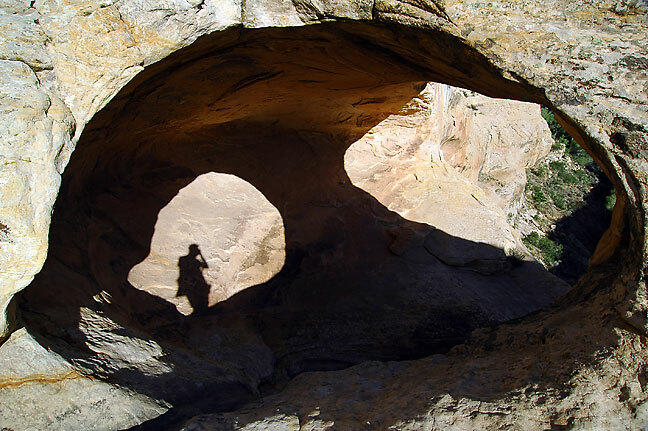 By the time I arrived at the Butler Wash bridge, the ruins nearby were in full shadow, so I concentrated on photographing the impressive natural bridge. Despite record-breaking heat, I was still able to take a couple of very nice hikes. 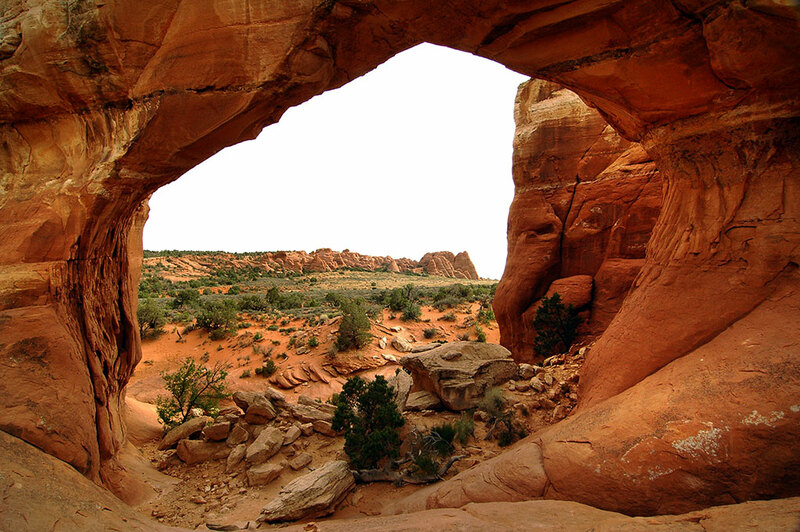 In the morning I drove to Moab, Utah, had some breakfast, then took the Potash Mine Road to the Jug Handle Arch. 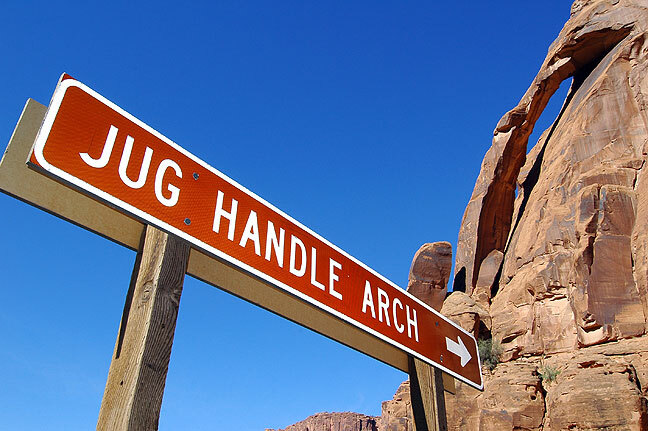 The sign for Jug Handle Arch leaves little doubt you are in the right place. There are several arches by this name, but this one might be the most aptly named. 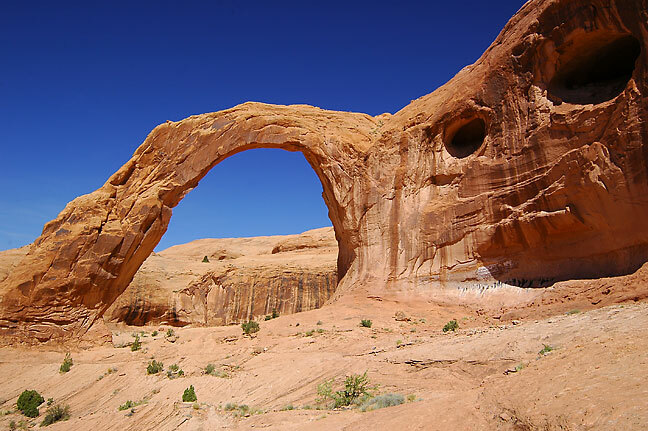 Though not the only natural arch named “The Jug Handle,” this one on the road to Corona Arch near Moab, Utah, definitely looks like its name. 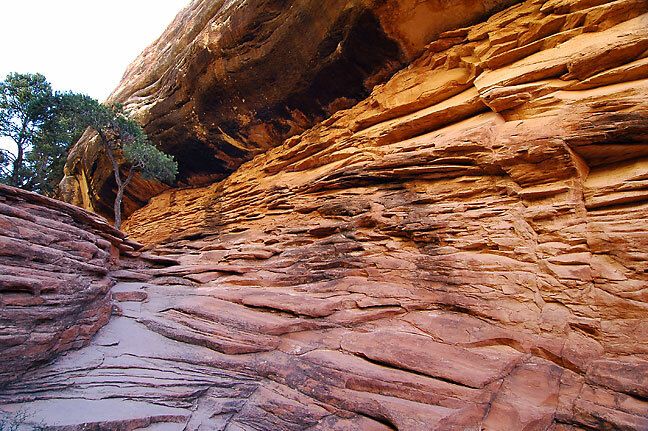 Early on the Corona Arch Trail is this stark cut in the cliffs for a rail line. 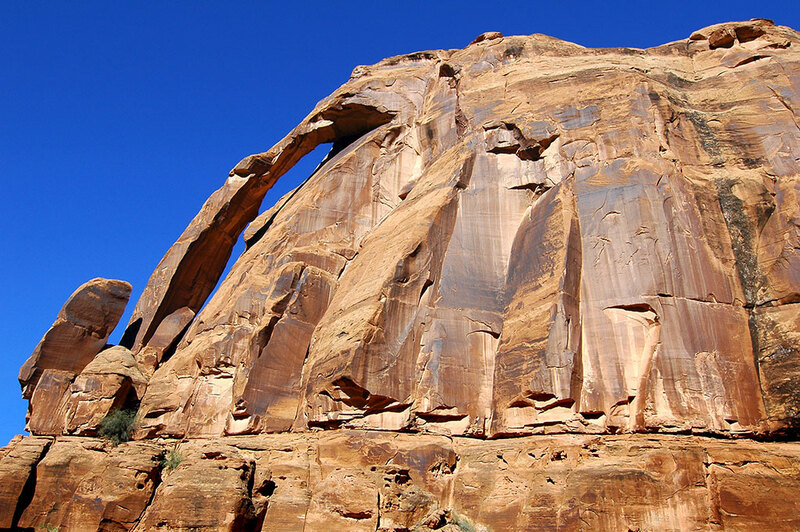 I hiked to Corona Arch, which is in the same vicinity as the Jug Handle. 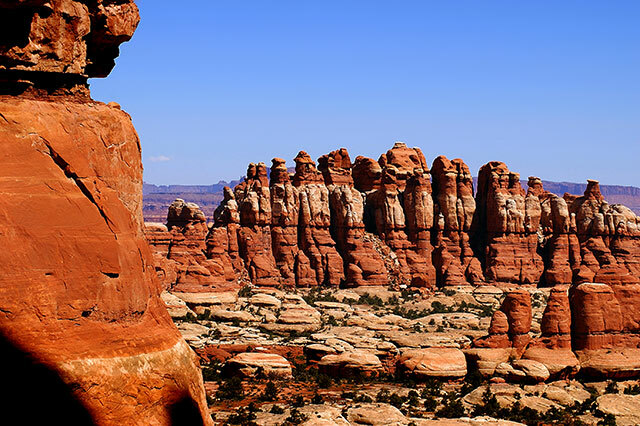 The trail is very similar to the Delicate Arch Trail, both in elevation increase and length, as well as character and difficulty. 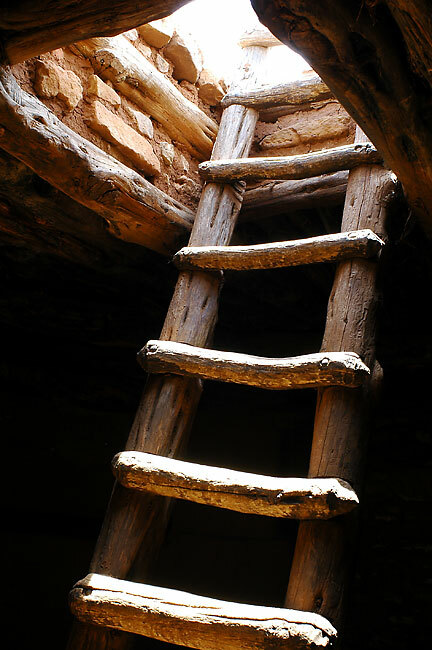 Aside from a grip cable along one piece of steep slickrock bench, a few mokee steps, and one ladder, it is not difficult. 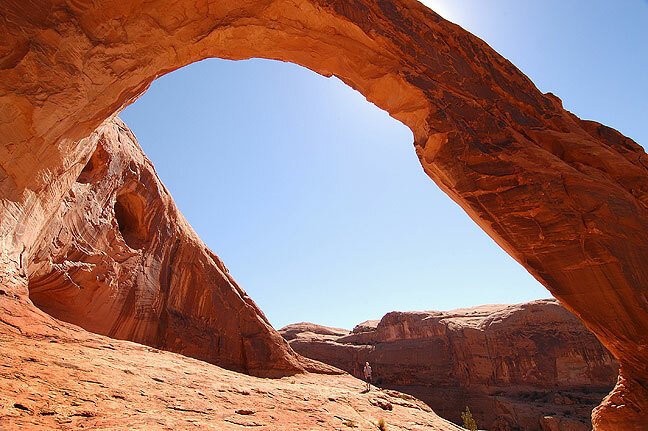 Corona Arch is beautiful, huge and impressive. 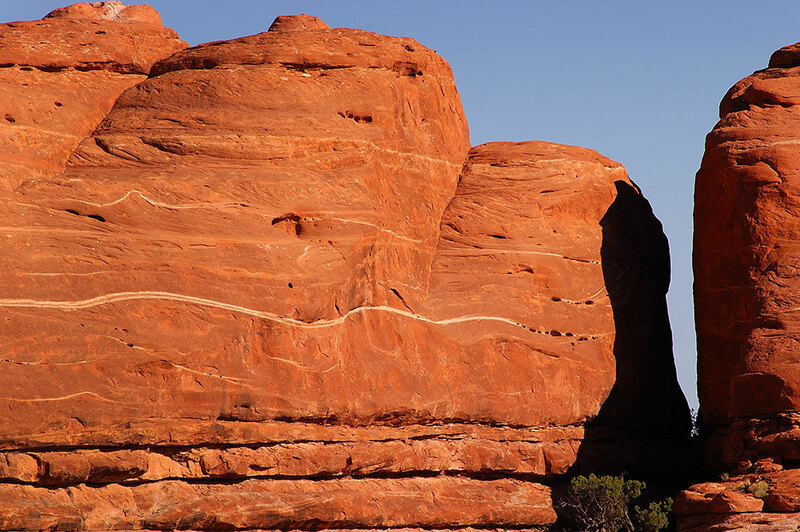 Though short and relatively easy to hike, the Corona Arch trail offers the kind of beautiful Utah red rock canyons look we love. 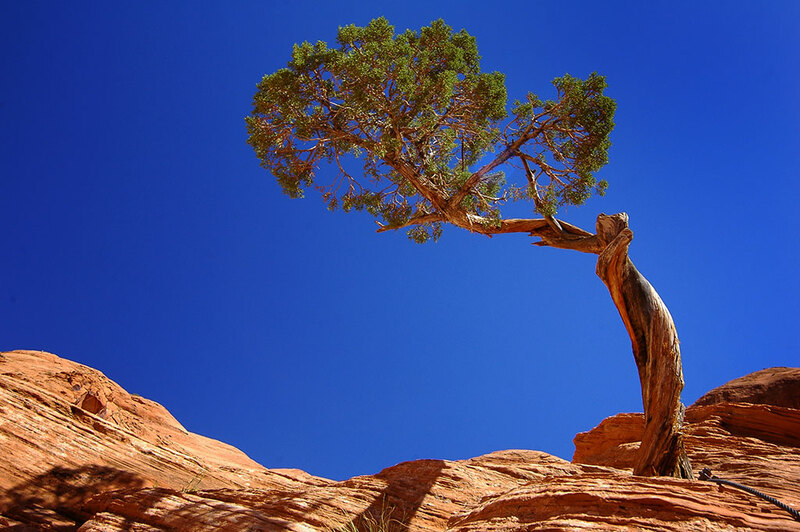 This small tree is the site of a grab-cable and a short ladder, placed by the BLM to aid hikers. 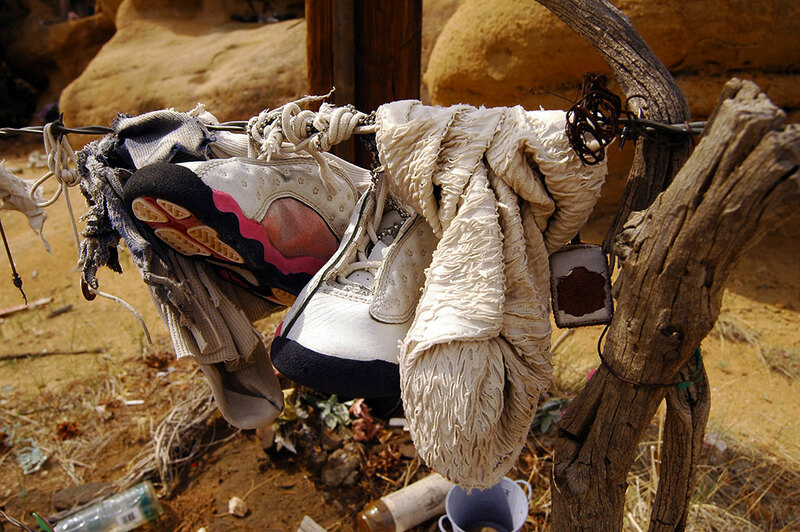 It wouldn’t be hard to find an alternative route without these items. 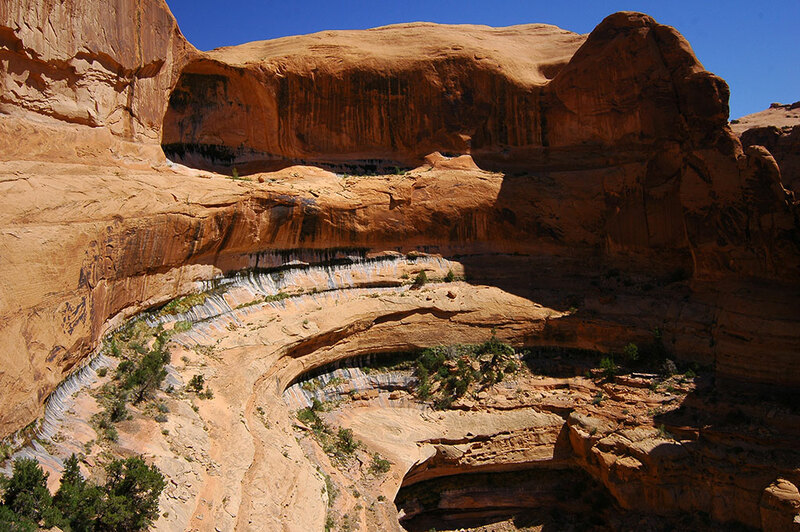 The Corona Arch trail follows a deeply-contoured cliff. 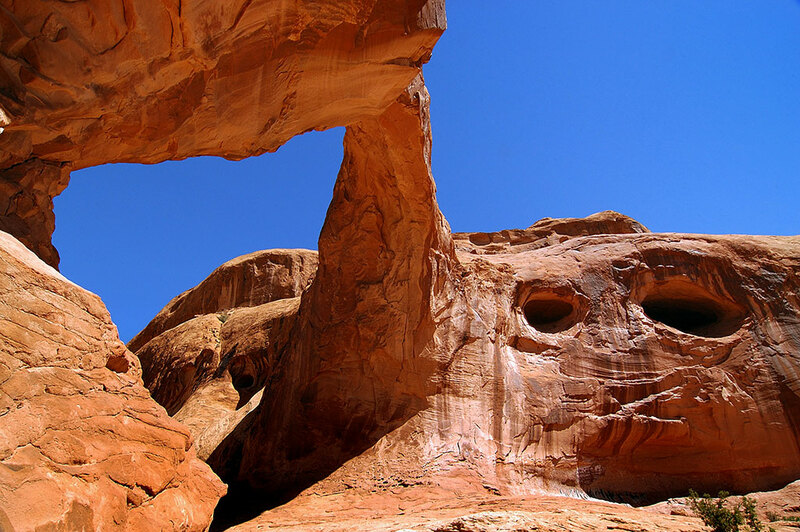 Bowtie Arch is just before Corona Arch on the trail. 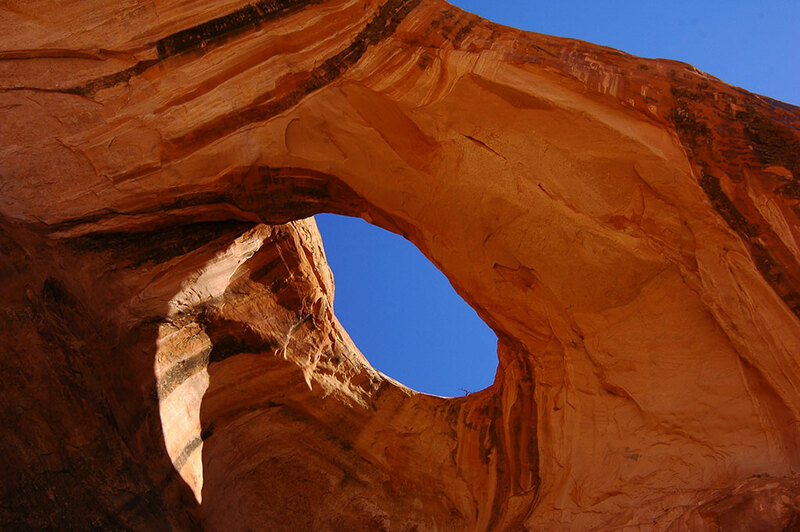 This view of Corona Arch looks up at the cliff face to which this feature is attached. 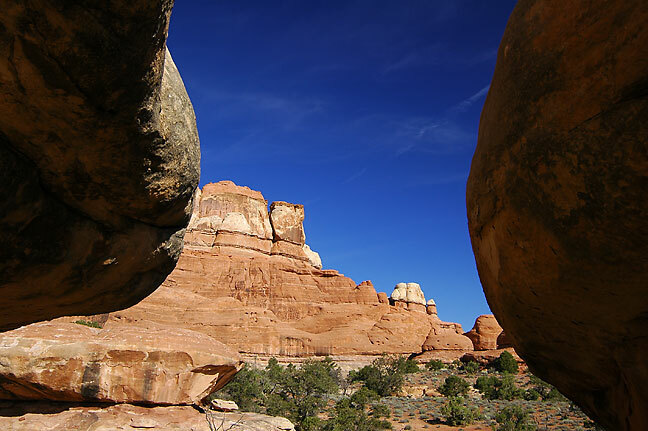 This view from directly under Corona Arch looks west toward the trail head. 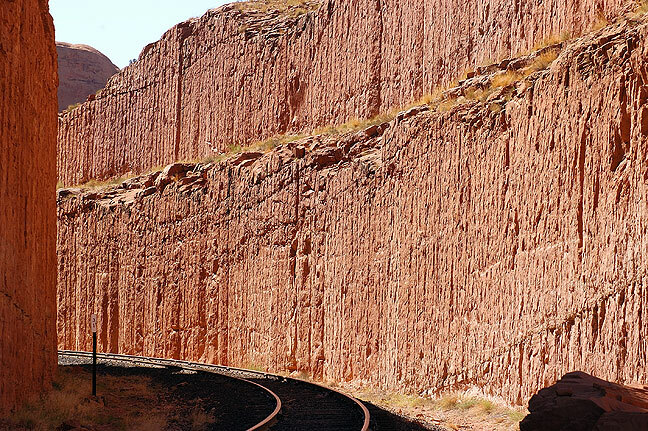 The cut for the rail line is visible. 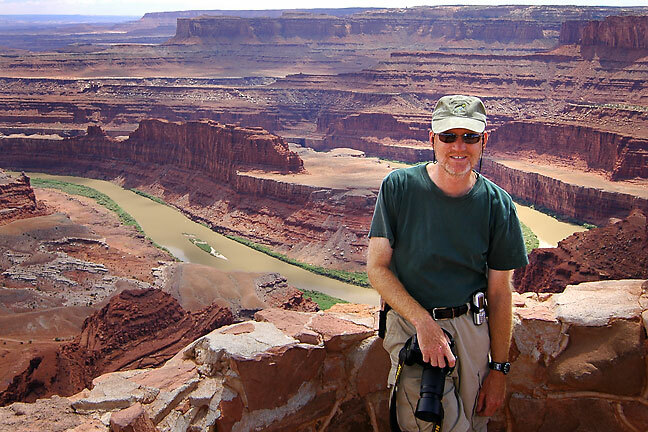 Your host poses for a photo at Dead Horse Point State Park. 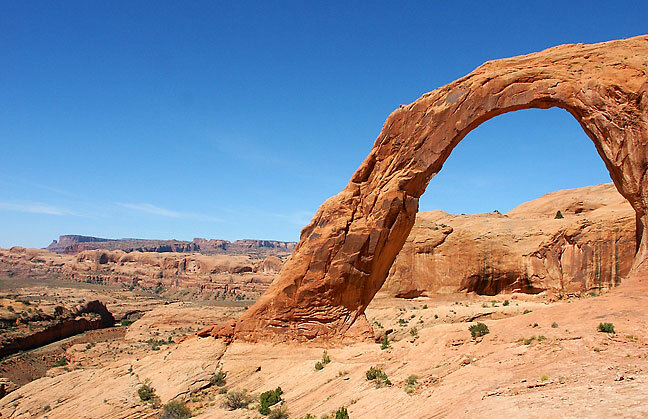 Later in the day, a park ranger told me that anywhere else in the country, Corona Arch would be part of a national park. 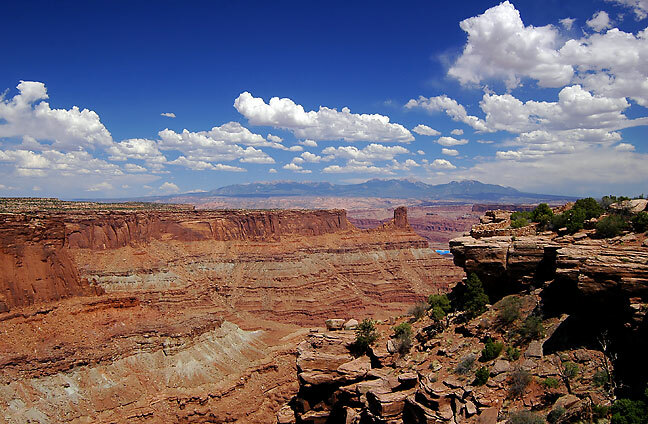 During the hottest part of the day, I drove to Dead Horse Point State Park just for something to do. 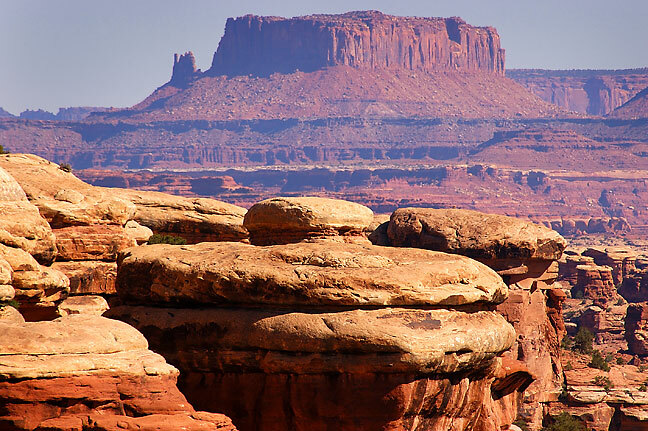 This view looks southeast from Dead Horse Point, Utah. 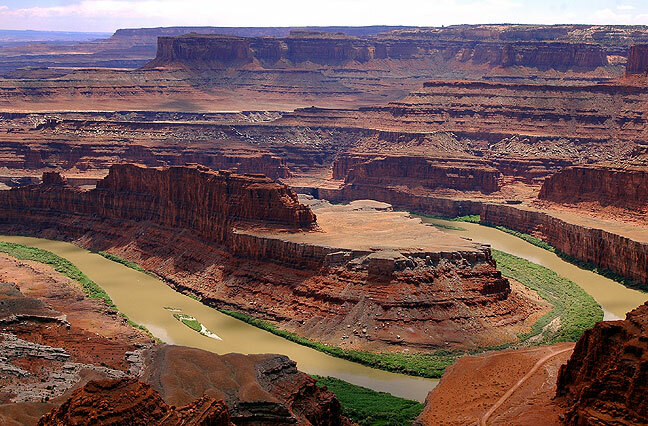 This is the standard view from Dead Horse Point, which I shoot every time I visit because it is quite spectacular. 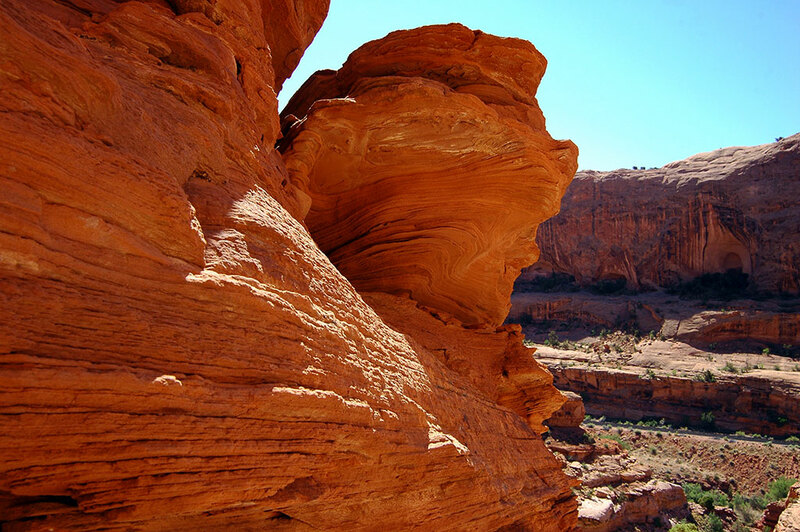 Photographs of it are sometimes misrepresented as being of the Grand Canyon. 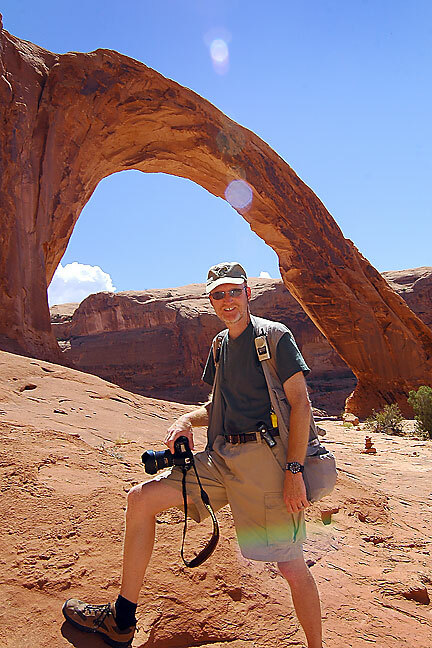 Later in the afternoon at Arches National Park, I made the loop between Sand Dune Arch, Tapestry Arch, and Broken Arch. It ended up being a pretty fun little hike. 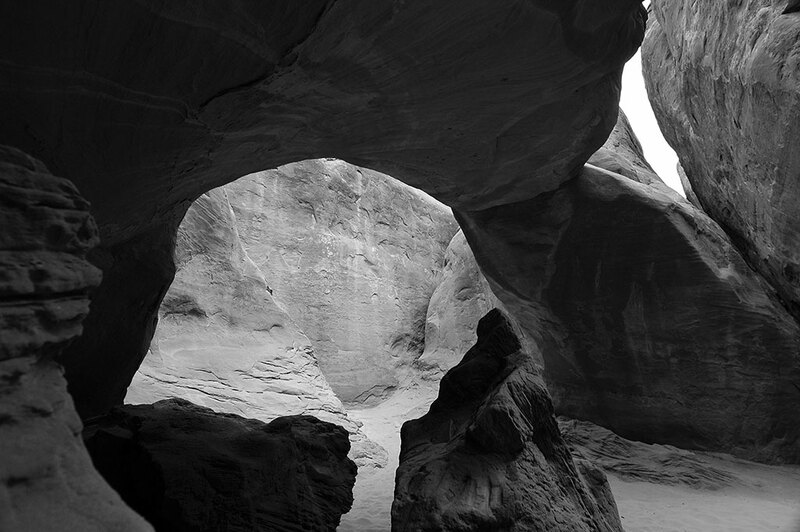 Sand Dune Arch is hidden in an alcove between two tall sandstone fins, and the sky was grey, resulting in very flat, monochromatic light, thus the black-and-white rendering. Sand Dune Arch is in a very narrow opening; this image was made with my widest lens, a 12-24mm, from as far back as I could get. 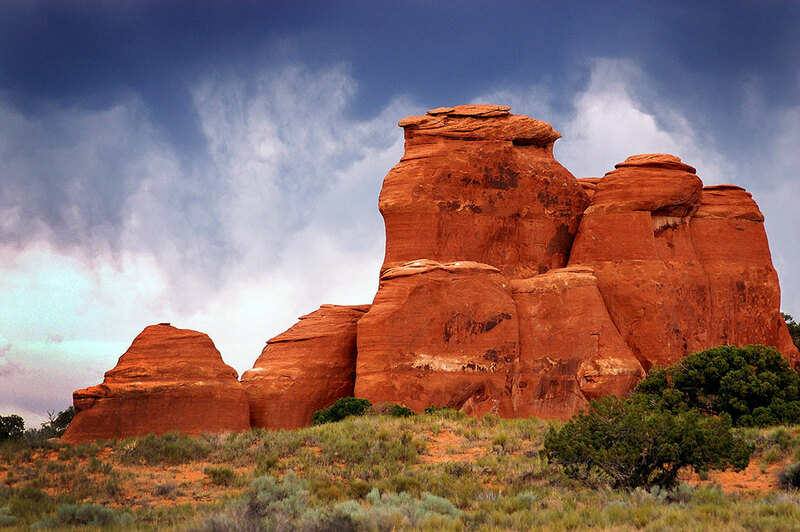 For a while the sky looked quite dramatic as I hiked at Arches National Park. 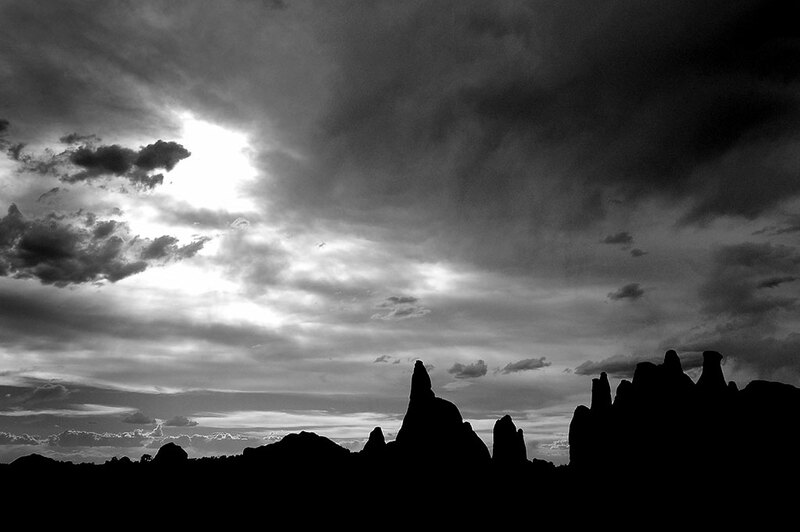 Virga hangs above sandstone formations at Arches National Park. Though it looked like rain for a while, I never got wet. Many trails in canyon country pass through narrows like this one on the Broken Arch trail. 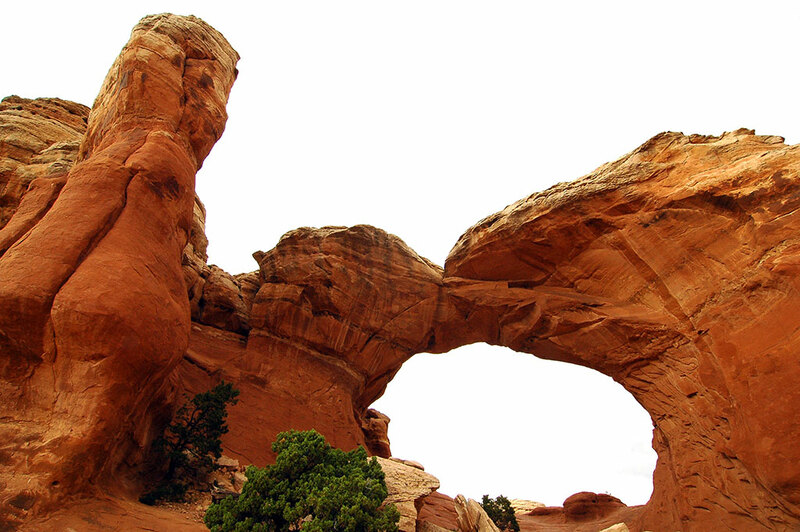 Despite grey skies and blowing dust, the hike to Broken Arch was a success. 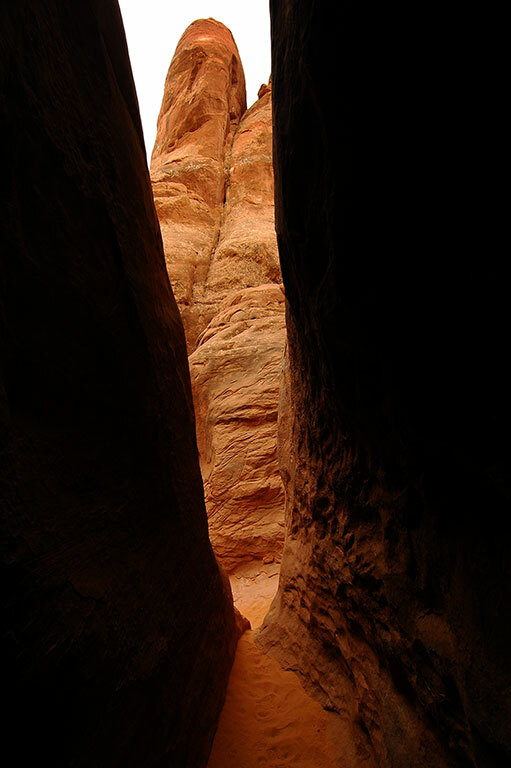 This view looks through the opening of Broken Arch. 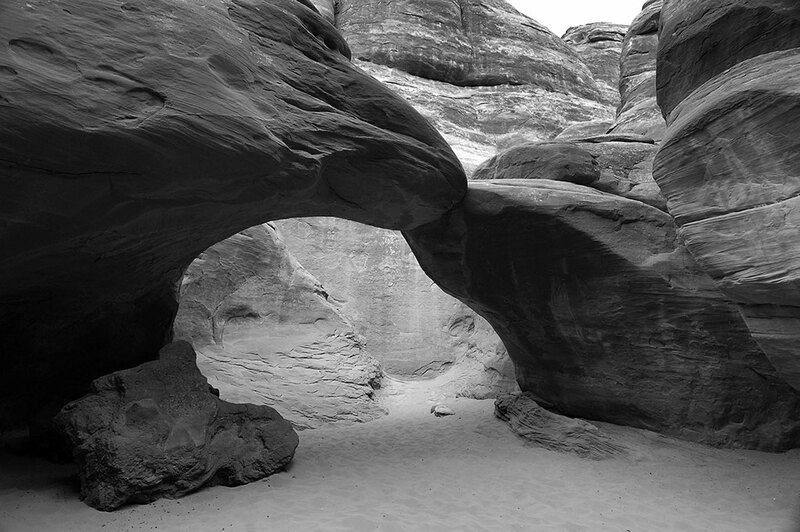 Tapestry Arch is also on the Broken Arch-Sand Dune Arch loop. 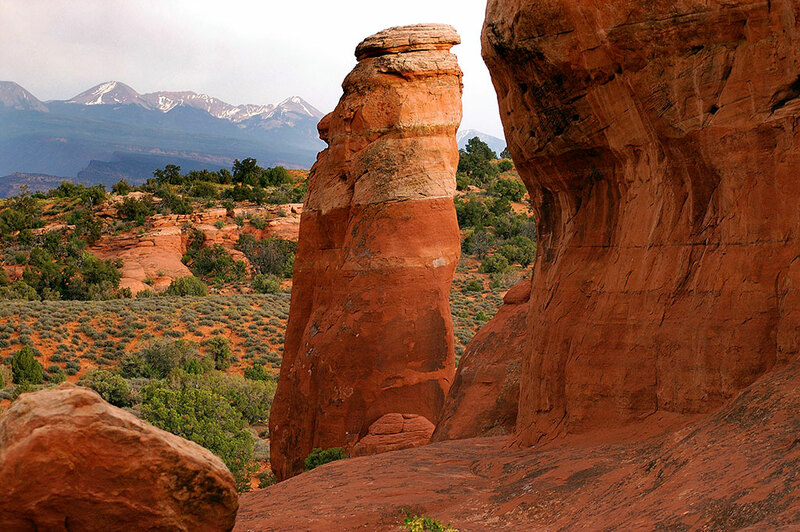 The Broken Arch trail is easy and fun, with no elevation change or scrambling. 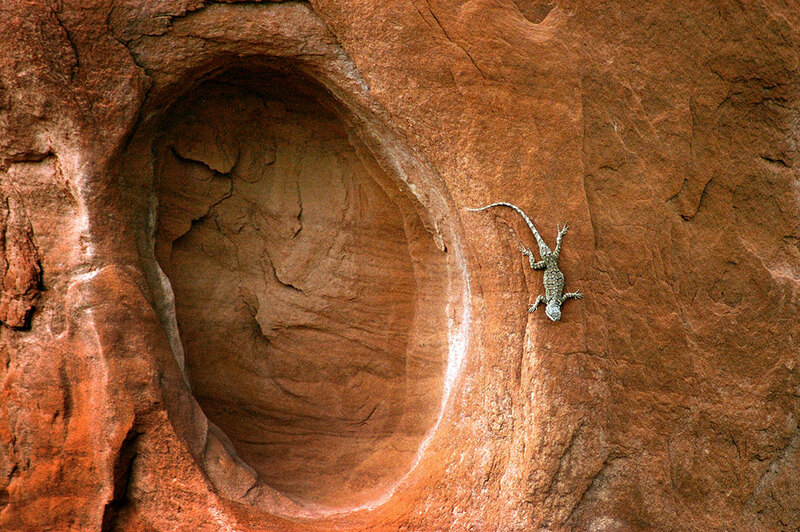 A red-tailed lizard clings to a rock near and small alcove on the Broken Arch trail. 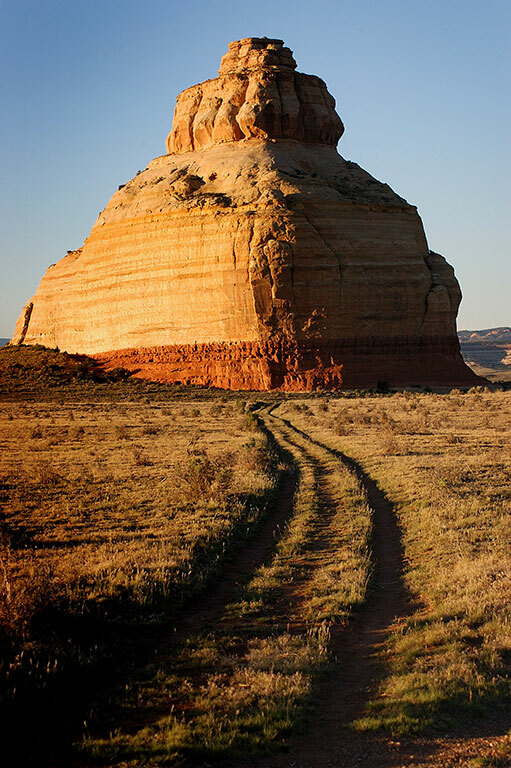 I stopped to photograph an old favorite, Church Rock, as sunset approached. 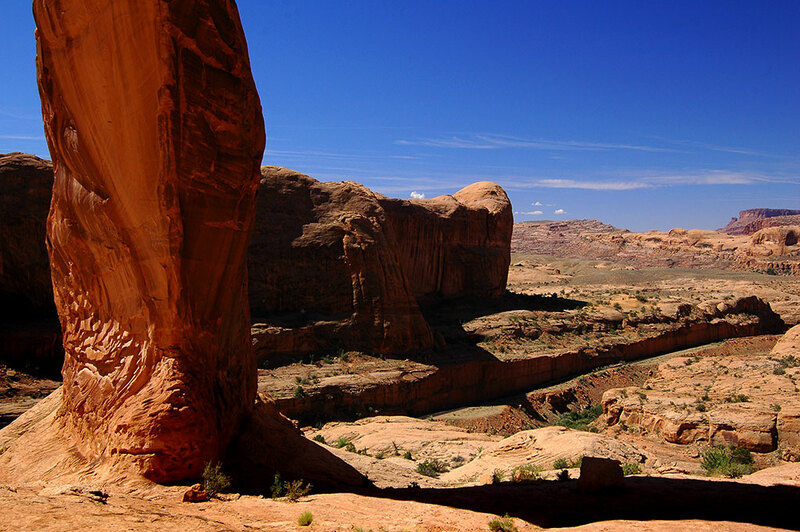 This feature is close to the highway between Moab and Monticello. 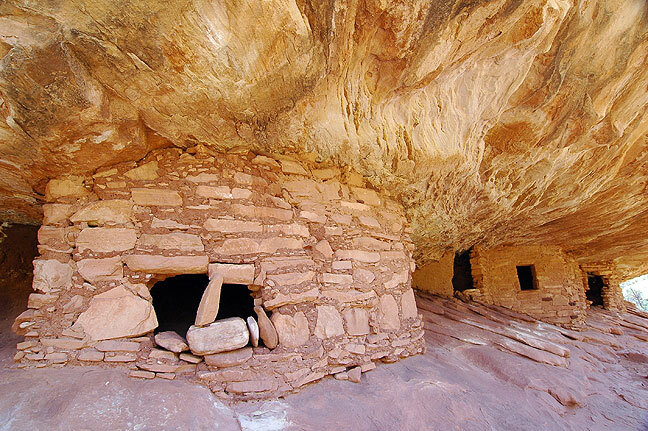 The House on Fire ruin is a little more than a mile up Mule Canyon. 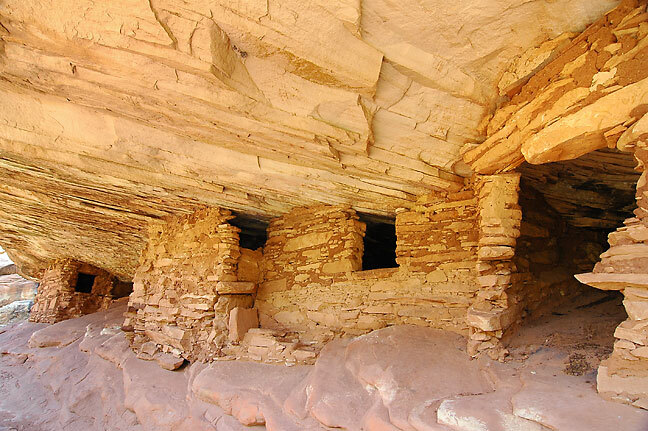 I hiked in Cedar Mesa to a native ruin in Mule Canyon called the “House on Fire.” It was a mile to the ruin, but I never saw anyone else on the trail. 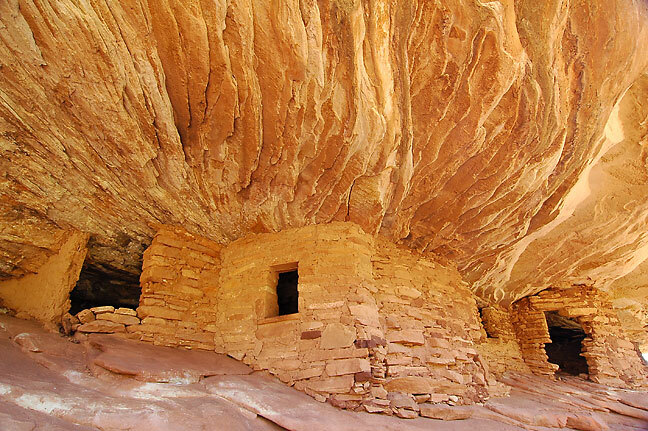 The “House on Fire” ruin is about a mile down Mule Canyon. 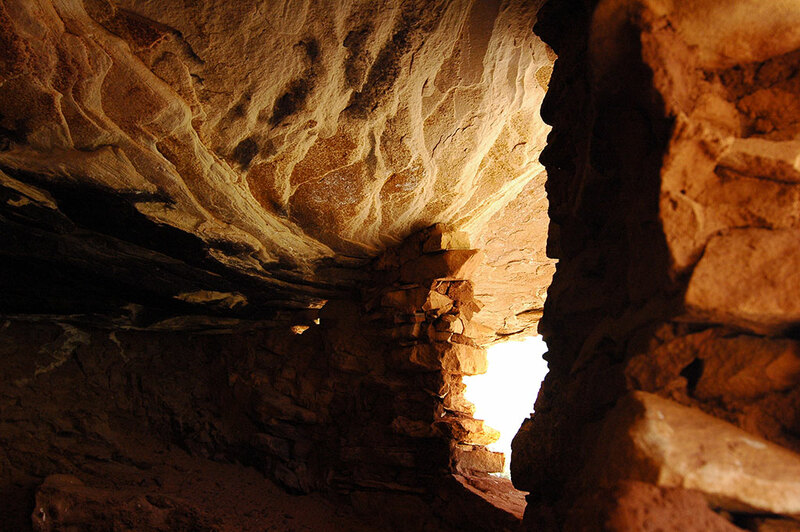 Though the openings and interior spaces are quite small and delicate, I was able to carefully squeeze into the House on Fire ruin to make this image. The heat continued, so after lunch I toured the Edge of the Cedars State Park in Blanding, Utah. It was fun and interesting, and worked out perfectly, since it thunderstormed twice in the afternoon. 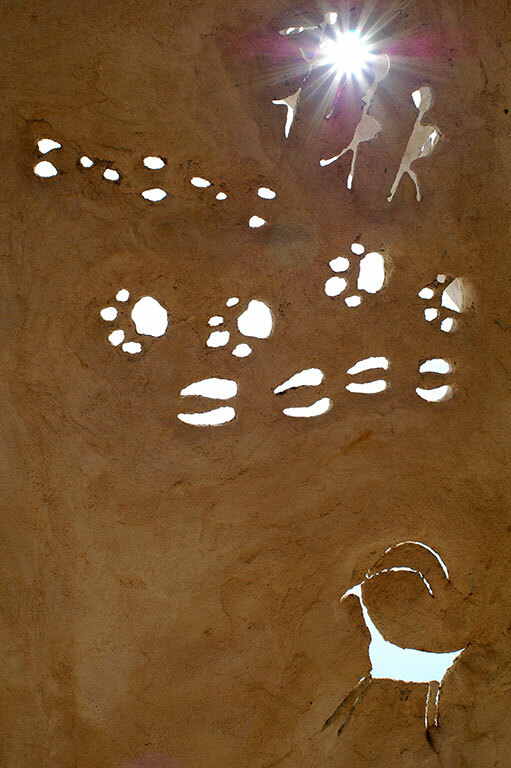 Sunlight shines through a representation of ceremonial art at Edge of the Cedars State Park in Blanding, Utah. These driving days included a quick stop at Great Sand Dunes National Park. It was too windy and rainy to do much. I also stopped and photographed Blanca Peak, some really cool roadside sites, including a very complex roadside grotto, and Capulin Volcano National Monument. 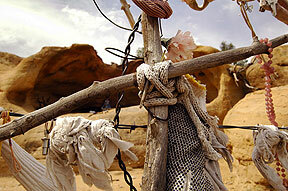 I spotted these odd items in the vicinity of Blanca Peak. I don’t know why anyone would load adobe onto pallets. 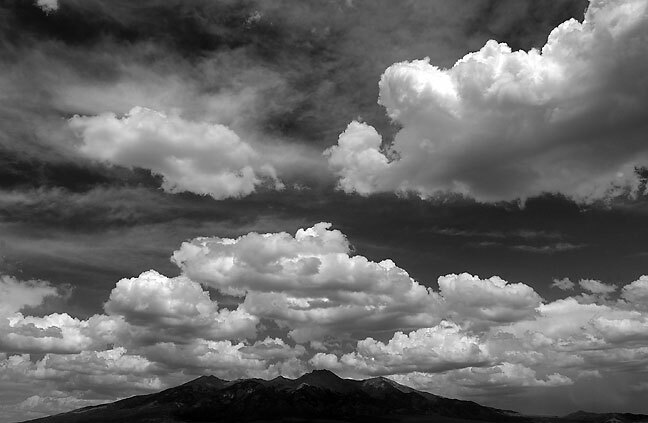 Clouds and the summer sky dwarf the 14,351-foot Blanca Peak at the south end of there Sangre de Christo Mountains of Colorado. Abandoned house and clouds near Yellow Jacket, Colorado. 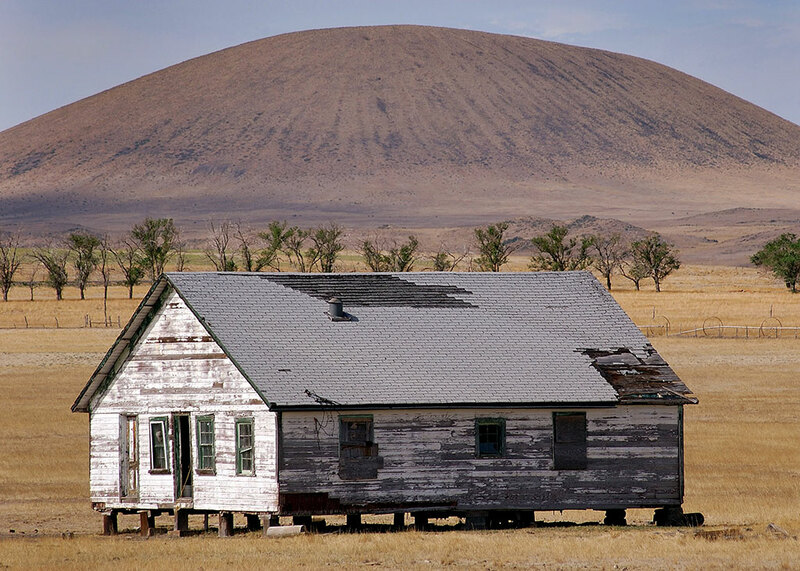 Though I didn’t shoot anything at Great Sand Dunes due to blowing sand, I spotted this juxtaposition of round and straight on the highway south of there. Roadside grotto near La Veta, Colorado. 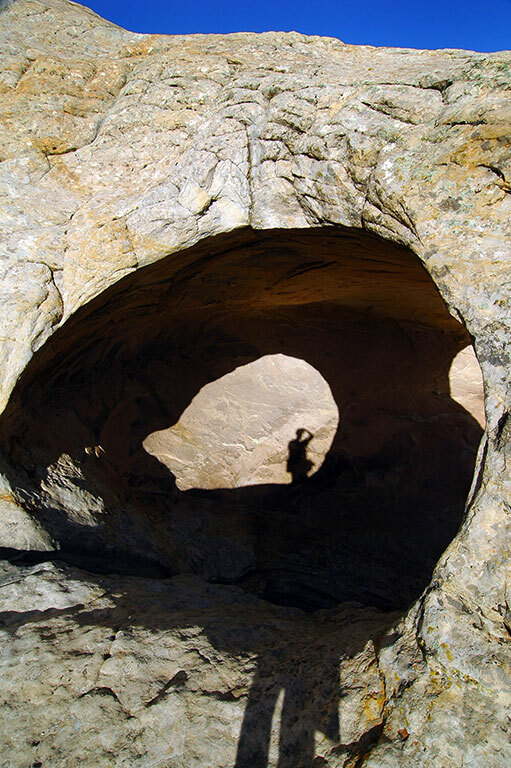 Another view shows the intricacy of the grotto near La Veta, Colorado. 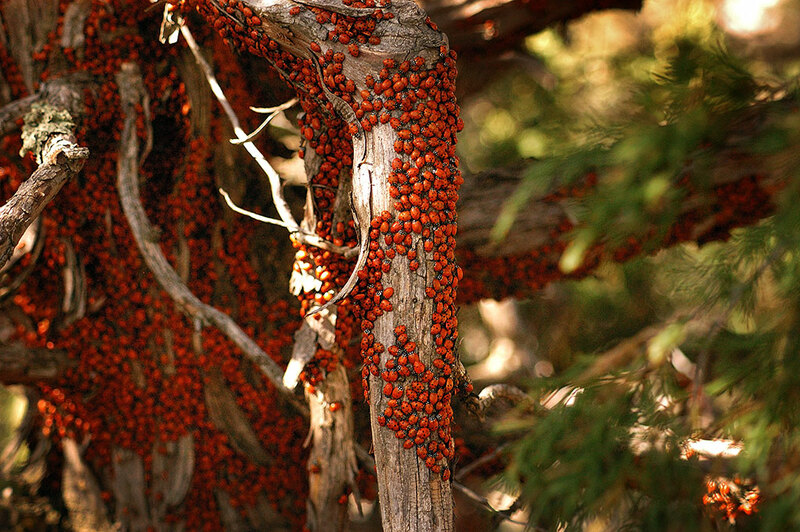 The Ladybug migration Capulin Volcano National Monument, New Mexico, is quite captivating. 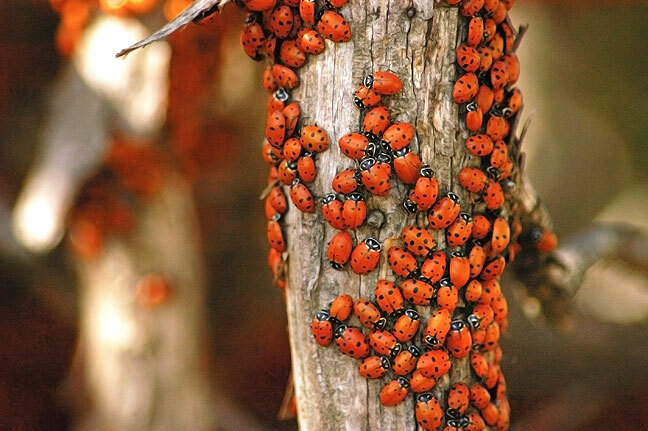 The Ladybug migration at Capulin Volcano is quite a beautiful sight, though it might be horrifying were it another insect. 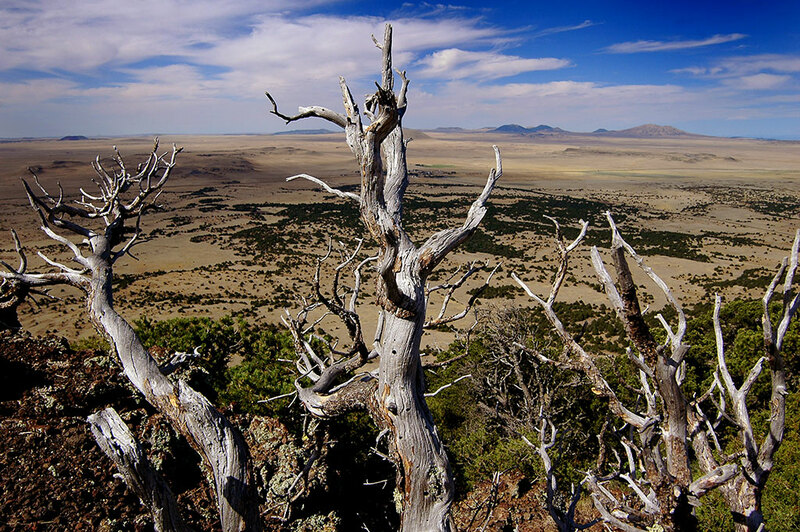 This dead tree graces the rim trail at Capulin Volcano National Monument in northeastern New Mexico. 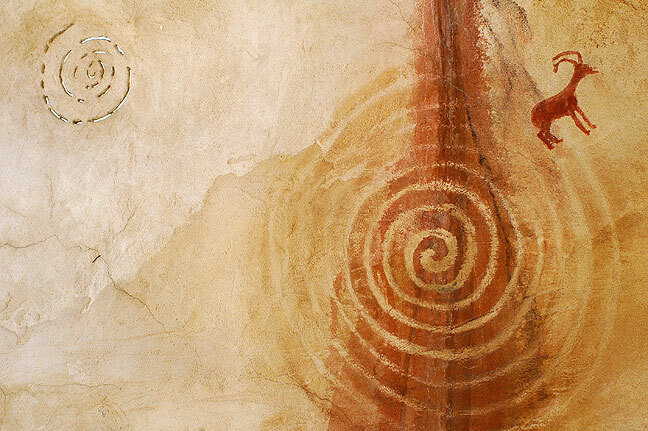 * My favorite has to be the last one, with the lone horse at Chimney Rock. Wil, one note: if you can get them to shoot it with your camera, that settles the question. If they shoot it with their camera and the promise they’ll email it to you, even if your give your email address in a business card, it will never happen. I see you’ve moved the horse to the top. Yay!